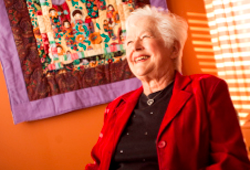 Jeanne Day '61 has enjoyed her share of adventure. She obtained her pilot's license in 1963, only hanging up her pilots wings when she turned 70 a few years back. That's when she channeled her energies into motorcycling-a two wheeled passion that led to a solo ride across Alaska. And if she's not cruising the country on her chopper, chances are you'll find her on water: Jeanne and her husband, Denver, have logged 15,000 miles by boat running up and down the Eastern Seaboard. A product of the Rust Belt (born in Ohio, raised in Michigan), Jeanne believes that her move West was liberating. "The culture of California supports you!" she says. After Denver took a job in Southern California in 1960, the couple relocated to Glendale. Intent on resuming her education (which had begun at Michigan State), Jeanne enrolled at Occidental, obtaining her teaching credential: "I had many cousins who taught, and the summers-off schedule appealed to me." She worked three years teaching elementary school before transitioning into administration, ultimately spending 37 years in the Mojave Desert, and Jeanne took on a new career as an accountant working alongside her husband. They now split their time between Hesperia and a second home in Smyrna, Del. The moment Jeanne stepped onto the Oxy campus more than half a century ago; she was impressed by the "niceness you get on a small campus." Occidental's strong academic reputation became apparent to her when she entered the job market, where she was hired almost immediately. "Oxy was instrumental in helping me do what I wanted to do," Jeanne says, and for that reason she has always made the College a beneficiary of her philanthropy. Jeanne has taken advantage of a simple way to make a gift through the IRA charitable rollover, which allows individuals 70½ or older to make a gift up to $100,000 from their IRAs directly to Occidental tax-free. Jeanne says she was very happy to learn she could make a gift using her IRA, and adds that the material she received from Oxy "was absolutely critical" in making an informed decision. In fact, she educated her broker! And now it's on to the next adventure.